Yarrow is one of the easiest perennials to grow and is a good choice for beginners. All it needs is full sun and well-drained soil. It thrives in average to poor soil and is drought tolerant once established. It has very few pest or pathogen problems. 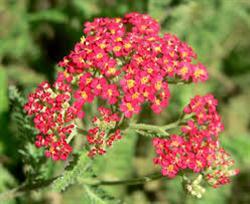 The Achillea 'Paprika' Yarrow is renowned for its large clusters of bright red flowers. As is the case with all Yarrows, the flowers fade as they age; the Paprika fades from red to salmon pink. This perennial garden plant is ever blooming with regular deadheading. This will likely stimulate a second flush of blooms in late summer. After the flowers have faded, cut the plant back by half and divide every few years to keep plants to a manageable size. Achillea 'Paprika' flowers from summer to early fall and attracts butterflies and makes a great addition to a butterfly garden. Plant for fresh cut flowers or dried arrangement.